The L’Oréal Paris Men Expert Barber Club Wash is a 3-in-1 hair and body wash that delivers all-in-one daily cleansing. 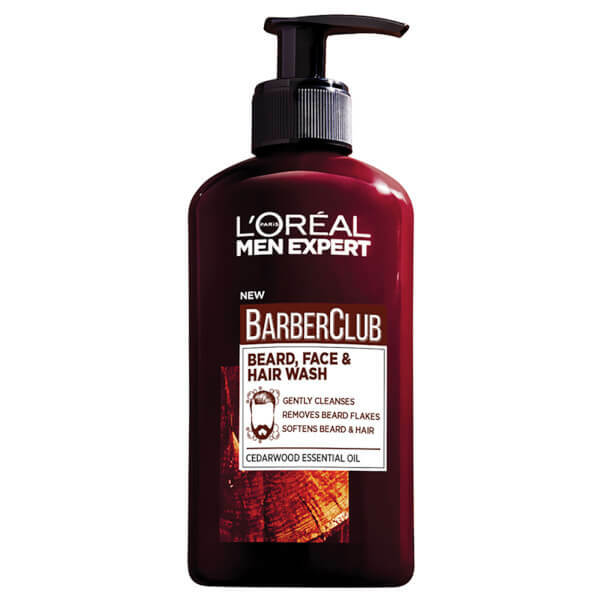 Forming part of the grooming collection inspired by expert barbers, the multi-purpose shampoo and cleanser helps to wash away beard dandruff and any unwanted residues and odours while respecting skin beneath. As a body wash, it gently yet thoroughly cleanses, lifting away dirt and impurities to leave you feeling fresh and purified. 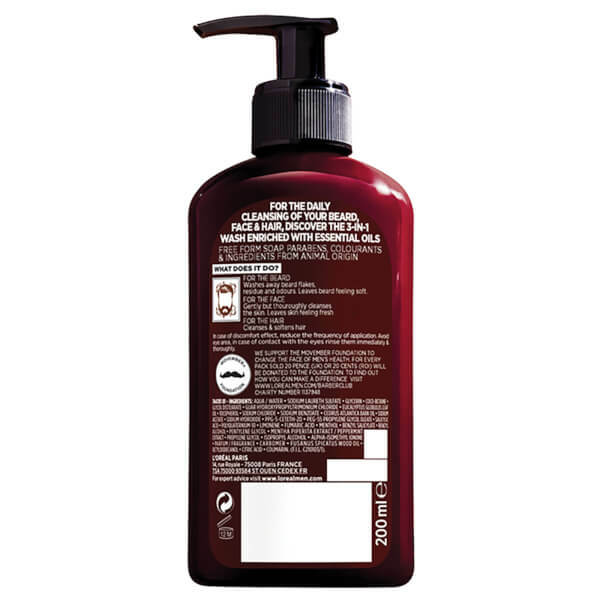 As a shampoo it softens and cleans hair for a revived feeling from head to toe. The conditioning body wash is powered by Cedarwood essential oil. Free from soap, parabens, colourants and ingredients from animal origin. Wet your face, beard or hair with warm water. Squeeze a generous amount of the gel onto your finger tips and apply it by spreading it onto your beard, face and hair. Rinse off thoroughly. Aqua / Water, Sodium Laureth Sulfate, Glycerin, Coco-Betaine, Glycol Distearate, Guar Hydroxypropyltrimonium Chloride, Eucalyptus Globulus Leaf Oil, Tocopherol, Sodium Chloride, Sodium Benzoate, Cedrus Atlantica Bark Oil, Sodium Acetate, Sodium Hydroxide, PPG-5-Ceteth-20, PEG-55 Propylene Glycol Oleate, Salicylic Acid, Polyquaternium-10, Limonene, Fumaric Acid, Menthol, Benzyl Salicylate, Benzyl Alcohol, Pentylene Glycol, Mentha Piperita Extract / Peppermint Extract, Propylene Glycol, Isopropyl Alcohol, Alpha-Isomethyl Ionone, Parfum / Fragrance, Carbomer, Fusanus Spicatus Wood Oil, Octyldodecanol, Citric Acid, Coumarin.